Mackie has announced a major update to the My Fader control app, which delivers powerful, pocketable control over Mackie DL32R, DL1608 and DL806 digital mixers. Designed for iPhone and iPod touch, My Fader v3.0 is ideal for on-stage performers controlling their own monitors or engineers who need quick mobile control over any mix. The new version includes a new updated user interface and an expanded feature set for additional control on-stage or off. "My Fader v3.0 is more powerful and user-friendly than ever before. Musicians have never had more control over their individual monitor mix," commented Ben Olswang, Mackie product manager. "This level of control used to involve tons of expensive hardware and endless cable runs. Now, you get the professional results you demand, all controlled wirelessly using musician's personal devices, saving setup time and cost." My Fader v3.0 new features include support for control alongside Master Fader v3.0, which delivers total control of any Mackie DL Series mixer from an iPad. It also features support for iOS8 and the new iPhone 6 and iPhone 6 Plus. The user interface has been redesigned, with a modern look and feel that is in step with the main Master Fader control app. The new design also supports a host of new features that will give users increased functionality and control. Channel ID can now be configured using My Fader. Users can add custom names, icons or even photos for effective identification during the show. Channel colors and output colors are also now supported. 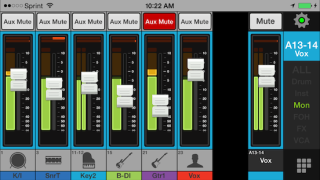 In the mixer view, users now have access to subgroups and VCAs for additional mix management. This allows one-touch volume control over groups of channels like backing vocals, horns or other channels that need to be controlled at once. The view group selector is now accessible, allowing users to view only the channels needed for that particular song or setup. Access limiting has also been updated, providing even more control over what each device can control, keeping specific users out of other mixes, including the front-of-house mix. My Fader v3.0 is available now as a free download directly to your iPhone or iPod touch. For full details and to download My Fader v3.0, visit https://itunes.apple.com/us/app/mackie-my-fader/id599029732?mt=8.